The east branch of the Penobscot River, part of the new Katahdin Woods and Waters National Monument. John Hough (from left), Gary Allen and Jesse Dumais discuss the new national monument at the Appalachian Trail Cafe in Millinocket just minutes before it was announced. Supporters of what’s now known as the Katahdin Woods and Waters National Monument are celebrating the addition of 87,500 acres to the National Park System Wednesday night. Susan Sharon reports on the Obama Administration's designation of donated land as the Katahdin Woods and Waters National Monument. The property east of Baxter State Park has been at the center of a fierce debate about the future of the Maine Woods for more than a decade. But the property’s former owner, Roxanne Quimby, has seen her dream come true on the eve of the National Park Service’s 100th anniversary. The widely anticipated announcement was made official in a nine-page proclamation from President Obama Wednesday morning. In it the president said Katahdin Woods and Waters contains an “extraordinary natural and cultural landscape” including mountains, woods and waters and “objects of significant scientific and historic interest.” He highlighted the scenery and geology and the strong ties to the Penobscot Indian Nation along with the bygone era of lumberjacks and river drivers who once worked in these woods. For Lucas St. Clair the news was hard to digest. Lucas St. Clair is the president of Elliotsville Plantation Inc. who’s been working toward this day for the past five years. St. Clair is also the son of philanthropist and entrepreneur Roxanne Quimby who used her wealth to buy and conserve land in the North Woods with the hope that it would someday be a national park or monument. St. Clair says it wouldn’t have been possible without help from dozens of local volunteers who held kitchen table meetings, made presentations, wrote letters and elevated the message of the campaign. Chief among them was the state’s largest environmental group, the Natural Resources Council of Maine. LIsa Pohlmann is the group’s director. Not everyone got behind it. Local votes in gateway communities to the monument rejected the national park idea by wide margins. The Maine Legislature lodged an objection. And members of Maine’s congressional delegation remain divided on the issue. Sen. Susan Collins and Congressman Bruce Poliquin issued statements saying they didn’t think the Preident should have used his executive authority given the lack of state and local support. But Congresswoman Chellie Pingree is a longtime park supporter. 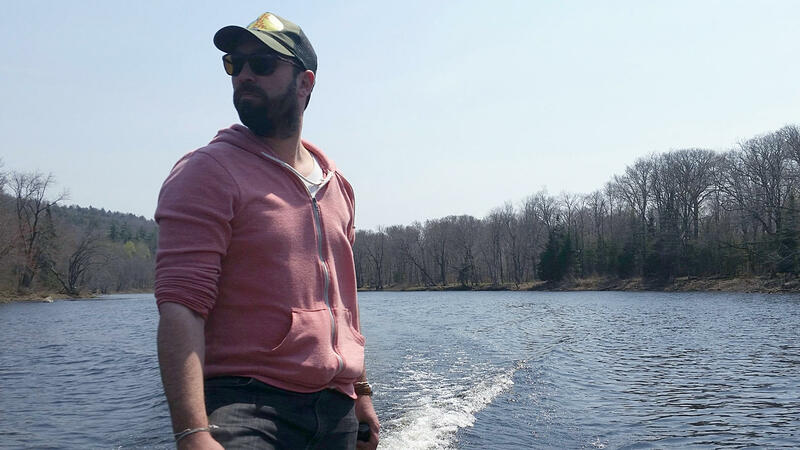 Lucas St. Clair piloting a boat in the Katahdin Region. The Katahdin region has faced a series of mill closures and hundreds of job layoffs in recent years. Senator Angus King, who was initially skeptical about the idea has also now signed on. King said in a statement that he’s been satisfied that the monument can be compatible with the existing forest products industry and will work to ensure that it lives up to its promise. The National Park Service wasted little time promoting its newest monument. Shortfly after the White House announcement a web page was activated with a phone number for future visitors to call. St. Clair says a superintendent and deputy superintendent have already been hired. And signs for the new monument should go up in the next day or so. But, shortly a series of public meetings will be scheduled to discuss a management plan. Hiking, campaing, paddling, snowshoeing and cross country skiing are permitted in the main section of the monument. But on a smaller section snowmobiling, hunting and ATVs will also be allowed. And St. Clair says he’s convinced that as more people become aware of how much is allowed and how special a place it is, they’ll become supportive, too. MPBN's Susan Sharon reports on Roxanne Quimby's donation of 87,000 acres of land in Maine to the federal government. It appears that philanthropist and entrepreneur Roxanne Quimby is finally getting her wish. Nearly 90,000 acres of land she owns east of Baxter State Park have been transferred to the federal government as of Tuesday morning. Quimby has been hoping to create a national park, and more recently a national monument in Maine’s North Woods, for nearly 20 years. While the monument designation has prompted a mixed reaction from Democratic lawmakers, Republicans in the Maine Legislature remain largely opposed to the plan that they say will actually turn out to be a job killer in the Baxter State Park region. Predictably, reactions have been mixed in Millinocket and neighboring East Millinocket, the towns involved in the monument debate over the past several years.